This dress was a total impulse purchase! I went to Banana Republic to return a dress that I bought to wear to Justin and Calla's wedding, but since I ended up wearing this one instead, I popped in on my lunch break thinking I'd be in and out in no time. With sales upon sales going on, I knew I had to have this dress when I saw it marked down. 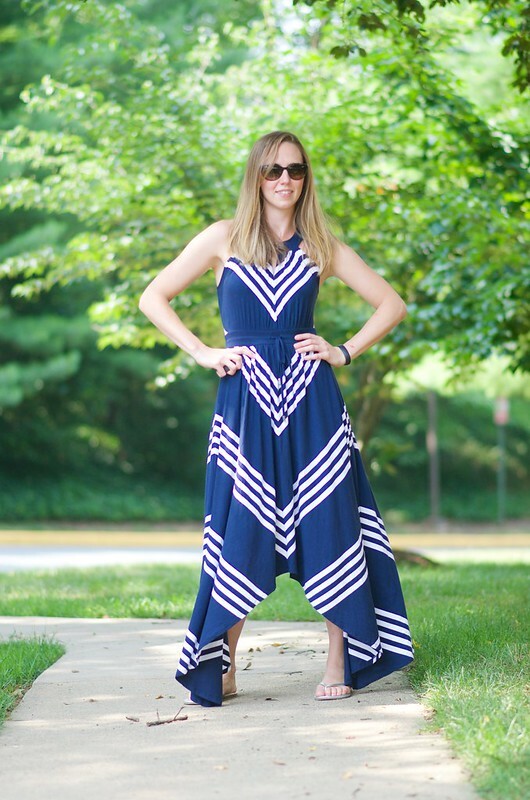 I just love the soft fabric, asymmetrical hemline, and you can't beat navy and white! Since it's super soft, jersey material, it's easy to dress up or down. I can see it working well into the fall with little jackets over it! I took a long time to come around to maxi skirts and dresses, but I am finally a convert! I have expanded my maxi collection to include 2 skirts and 5 dresses now. It's a trend that is so comfortable and is so versatile! I wore it to Becca's launch party for her Rodan and Fields business. It was nice that she had a bunch of us over for bunch before going into the business launch. It was great getting to chat with her and some of her friends from Reedville. It was especially awesome to get to see little Elise and Becca's tiny baby bump with number two!